Iranian Foreign Minister Mohammad Javad Zarif attends a meeting on peacebuilding at the United Nations in New York, on Tuesday. It was a reference to Saudi Arabian Crown Prince Mohammed bin Salman, who just this month wrapped up a three-week tour of the United States. The Saudi prince traveled from Boston to Silicon Valley in California, and although a final price tag is not known, the trip was reported to be lavish and included meetings to encourage millionaires and billionaires to invest in his kingdom. Iranian diplomats, by contrast, are preparing for the possibility that the United States might restrict trade even more with Tehran, by withdrawing from the Iran nuclear deal and reimposing sanctions. If the U.S. decides to pull out, Zarif says, Iran most likely will, too. Officially, Zarif was in New York for meetings at the United Nations, but the standoff with the United States is an overriding concern. In an NPR interview with Zarif on Monday evening, it was apparent how the rivalry with Saudi Arabia is a factor in many Iranian decisions — including the uncertain future of its nuclear agreement with the United States and other world powers. Iran is the most populous nation in the Persian Gulf region and Saudi Arabia is the richest. Before Iran's 1979 revolution, both were considered vital allies of the United States. Afterward, Iran turned against the United States. The Saudi-U.S. relationship, while deeply complex, remained close. "I think Saudi Arabia has been obsessed with Iran for the past 40 years," Zarif said in our conversation. "They have tried to exclude us from this region." If that was the Saudi goal, it has failed. Iran is deeply influential in Lebanon, Syria and Iraq, and it is believed to be linked with rebels who hold the capital of Yemen. Zarif denied his country is equally obsessed with the Saudis, but his comments and those of many Iranians suggest otherwise. People in each country have a tendency to run down the poor human rights record and lack of freedom in the other. "We believe that Saudi Arabia is an important player in the region [which] needs to be more responsible in its in its approach. But it is an important player in the region that cannot be excluded," he said. "I believe if Saudi Arabia came to the same recognition, we would be much better off." Iranians and Saudis are on opposite sides in several conflicts, most directly in Saudi Arabia's southern neighbor, Yemen. After rebels known as Houthis seized Yemen's capital in 2014, a Saudi-led military coalition directly intervened. Saudi airstrikes are blamed for many deaths; the war has led to economic collapse and widespread disease. 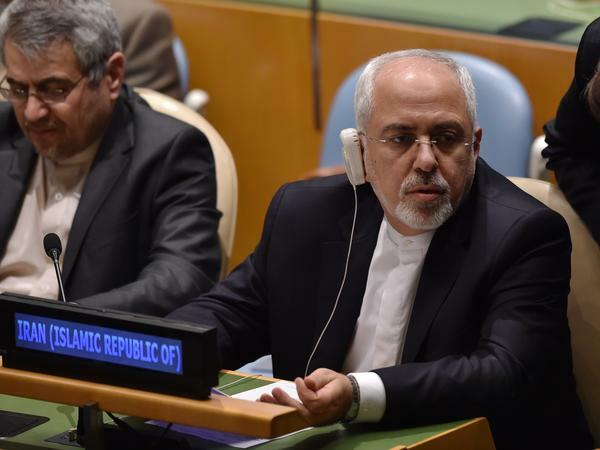 "Saudi Arabia can decide today and stop this bloodshed," Iran's Zarif said. But the Saudis say they intervened against the Houthi rebels because Iran supported the Houthis. Saudi and U.S. officials insist the missiles that the Houthis occasionally lob into Saudi territory were made in Iran. Foreign Minister Zarif denies allegations that Iran has supplied the missiles — yet he adds that old Iranian missiles could have fallen into Houthi hands. He also speaks up for their right to a share of power in Yemen. "I've talked to them and they're ready for peace negotiations," he said. "But what we need to do in Yemen is to have an inclusive government in Yemen. That includes everybody, including the Houthis. And we are prepared to use whatever influence. We — nobody controls anybody in Yemen, but we have some influence and we are prepared to use that influence." Ultimately, the specter of Saudi Arabia hangs over the decisions Iran may face over the nuclear deal. The agreement says Iran must curtail its nuclear energy program, which world powers say could lead to nuclear weapons development, in exchange for billions of dollars in sanctions relief. President Trump is eager to demand changes to the agreement if the U.S. is to remain in the deal at all. A May 12 deadline is approaching by which the President must either extend Iran's sanctions relief, or else allow the accord to begin falling apart. Parts of the Iran deal begin to expire in 2025. Zarif is not interested in renegotiation. "Opening this package would be tantamount to opening a Pandora's box, and we'll never be able to close it," he said. Iran has rejected limits on Iranian ballistic missiles. Zarif sees no point in extending the deal or adding more safeguards. Meanwhile, Saudi Arabia continues to make major military trade deals with the United States. Iranians have been reluctant to accept any arms limitation that does not also apply to the Saudis. The Saudis, not surprisingly, have been similarly reluctant — and should Iran ever seek a nuclear weapon, the Crown Prince Mohammed said last month, then his country would too.